Curry Chickpeas Stuffed Sweet Potatoes- A solid and simple dish that has so much to offer when it comes to flavor . Chickpeas simmered in an aromatic curry coconut sauce . Vegan Comfort food at it’s best! When you are craving curry in the form of an impressive main course or side that will please the whole clan. 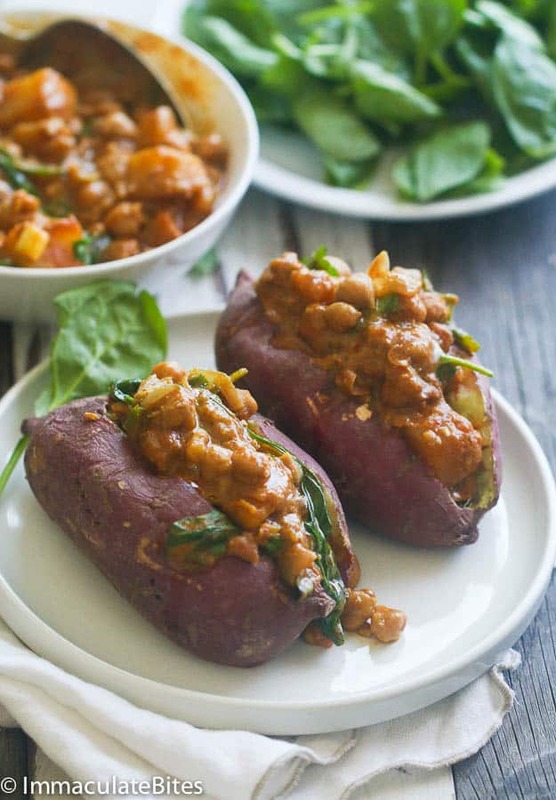 Curried chickpea stuffed sweet potatoes will satisfy that craving. It’s creamy, luscious and so satisfying. Now if you have never tried curried chickpeas, you must! 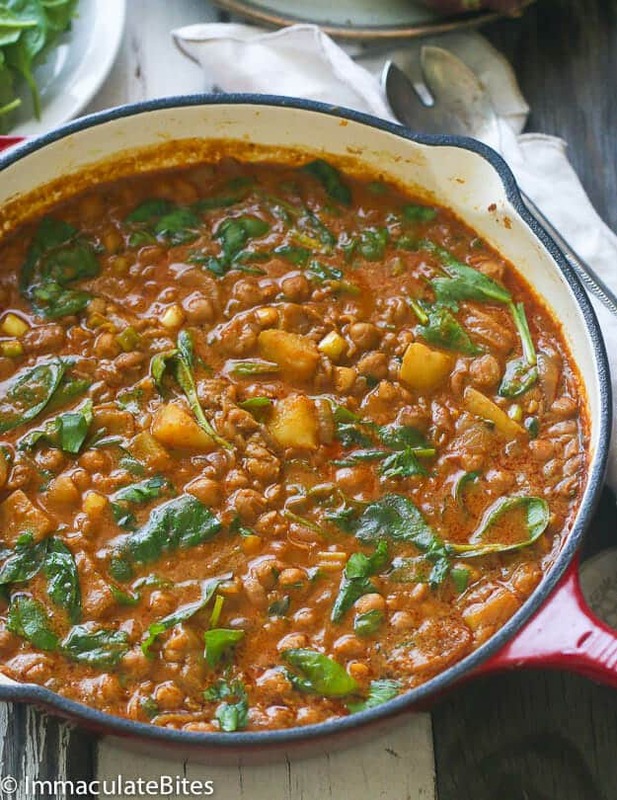 It’s one of those meals that everyone seems to enjoy .In addition, it’s also a delightful way to use up any extra cans of chickpeas that are just sitting in your pantry. You really want to transform them into something even better than hummus. And this is it!!! The best part is, the chickpeas are only the beginning! 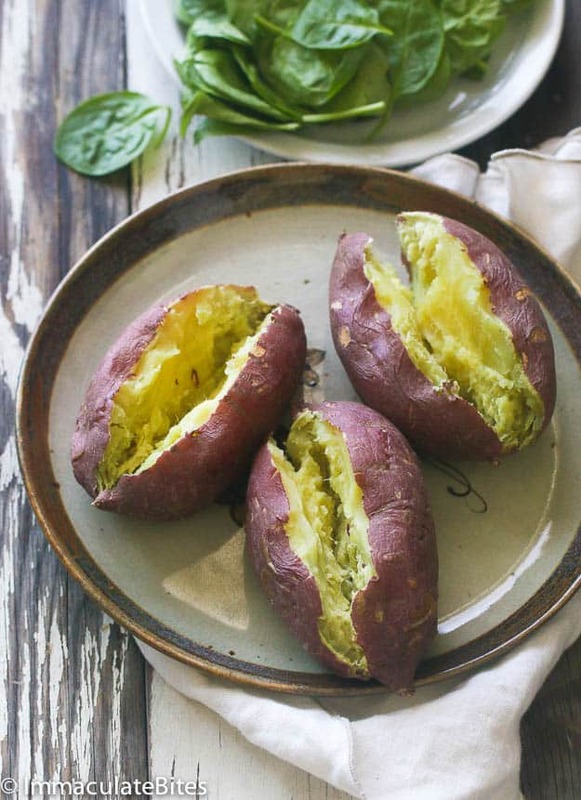 Although a highlight of the recipe, the baked sweet potatoes play a significant role as well. 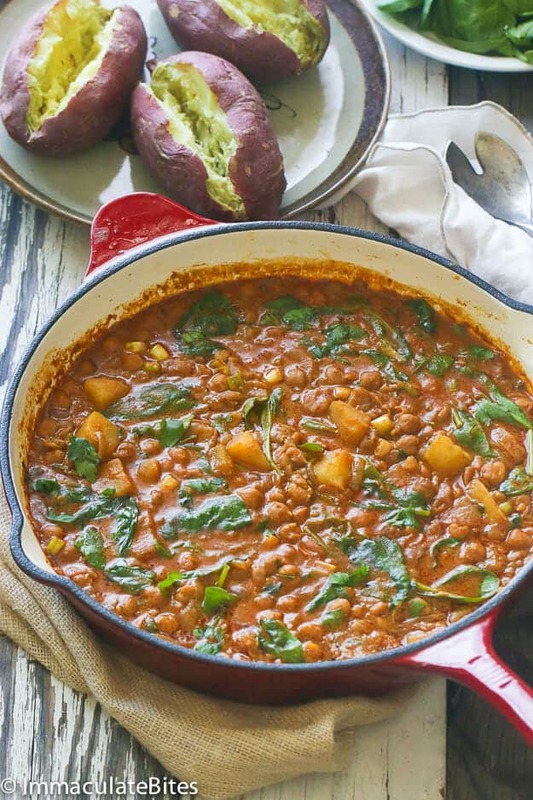 Yes, the curried chickpeas bring the bold flavor as well as some heat but let’s not forget about the potato’s sweetness. Talking of sweet potatoes. I used the Japanese sweet potatoes which are more denser and starchy .Asides from the visible difference (yellowish, pale interior), there is no big difference. When sweet potatoes are baked, they are almost fluffy in texture making them all the more delicious. When that baked sweet potato is stuffed with the curried chickpeas, you have an eye-catching dish that tastes even more delectable than it looks. You’ll first notice the spice and nuttiness of the chickpeas. That curry powder and coconut milk gives them oomph and the subtly sweet, almost caramel like taste of the potato accompanies that boldness. When the bold and the sweet combine, the result is one satisfied palate. Everything is well balanced and melds beautifully but all the elements remain distinguishable. Once the final product is in front of you, it will grab your attention visually, entice you with the aroma and the first bite will have you hooked. Enjoy every last morsel and know that you are eating something appetizing that happens to be good for you. Soul food! Heat up large sauce-pan with oil, and add onions, garlic, thyme, cumin spice, all spice, smoked paprika, nutmeg and curry powder, stir occasionally for about 2-3 minutes until onions is translucent. Next add chickpeas, green onion and broth. Bring to a boil and let it simmer until sauce thickens, it might take about 18 minutes. While curry is simmering. Cook sweet potatoes in your microwave: Prick the potatoes all over with a fork. Microwave on high for 8 to 10 minutes or until sweet potatoes is tender, turning the potatoes once. Clean and dry the sweet potatoes, poke holes into the sweet potatoes, place in the microwave and cook for about 4 minutes. Remove , let cook for a couple of minutes Slice open the sweet potatoes and stuff! If your sweet potatoes are large, cut them in half. 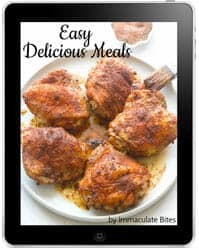 We cooked this recipe and it was truly delicious!! thanks a lot! Do you know which country from the Caribbean is more typical from? or maybe do you know the traditional name for the dish? 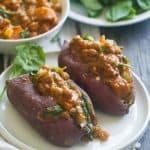 I run a Cafe/Bar in Bathway, a beach in Grenada and recently people have been asking for vegetarian foods, so I would like to try your Curry, Cheakpea Stuffed Sweet Potatoes recipe, if you don’t mind. I am not a vegetarian myself, although I do eat vegetarian foods. My 15 year old daughter who is, sirt of, but she’s in Canada right now and would like to cook it for her when she returns in January. Thank you for such an interesting recipe. By all means do try it out. It’s a heat with the family. All the best with your Cafe!!! What can be used instead of the 1-2 cups of potatoes? You are a true wonder! As a recent vegan(for spiritual reasons primarily), i really needed some support! MY community is not vegan,this means everything! Thanks Aviva. Glad I could have been of help. This was delicious. Thank you for taking the time to share your recipe. Sooooo good! How do you think this would taste stuffed in plantain instead? Do you think the flavors are compatible? You must tell me the secret you use to make every one of your food pictures so mouthwatering. Everyone now is a food photograph but most miss the fact that I don’t want to see their fancy equipment or artsy presentation, just the food! But yours always do the trick for me :0. Wonderful curry…do you think I can sub the one cup water/broth with more coconut milk? I’m a coconut fan. No secret here Didina! You get Me!!! I want the food to SHINE. It’s all about the food right? And I do my very best to make it as appetizing as possible.Plus don’t have space or money for fancy equipment. You certainly can sub the water with more coconut milk. Love the idea of sweet potato bread . I should try making some… Tis the Season!!. Always SO happy to hear from you! Haha, it should ALWAYS be about the food! That’s my motto! Sweet potatoes are hard to find and expensive here but I always manage to get some because they were a favorite of my grandma, here they are known as “American potatoes”: she used to go all the way to the city (we live in the countryside) just to buy them. I managed to make her taste some of the Southern USA dishes with sweet potatoes before she died, she liked them a lot! So sweet potatoes will always carry sweet memories for me. I also think that grannies are the best chefs, even without Michelin stars. Yum…such an interesting way to enjoy Japanese sweet potato. I wonder if cannellini beans can be instead of the additional potato in the stew (more protein). Sounds delicious! What temp should I heat the pan to? Medium? Yes! Medium works just fine. Such a great sounding curry, I am usually firmly in the ‘Indian’ camp when it comes to Chick Pea Curries but the flavours in the sound fantastic, gotta give it a try. Thanks Brian! Do le me know how it works out for you. This recipe is so beautiful and creative! 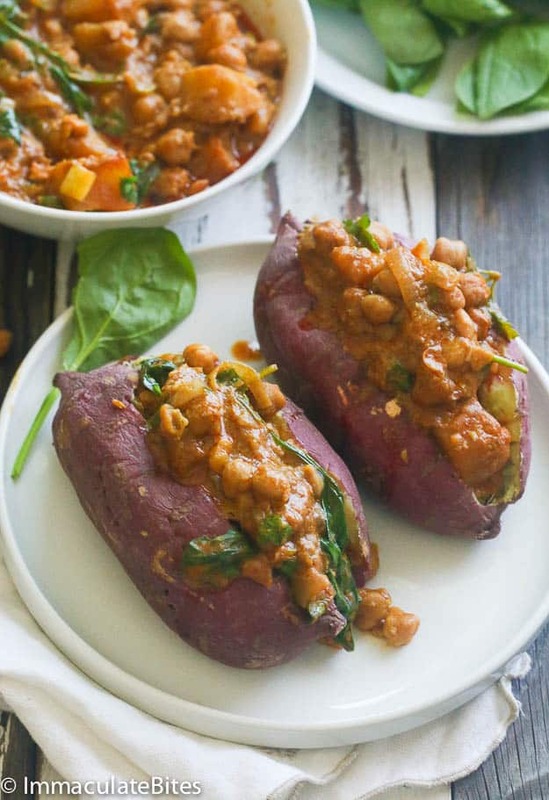 Topping he sweet potato with the curry is a lovely idea. Somethings I find myself getting into a rut with rice and pasta. Great idea! Don’t we all! It’s always great to switch things up. I am loving your chickpeas dish with sweet potato. My two favourite items :D.
And scrolling down your recipe reading the list of spices used…just makes me want to get up and try making these gorgeous bite :D.
Thank you for sharing a wonderful creative recipe, I have been looking for inspiring recipes on other blogs and found yours, I am thrilled to see you have such wonderful ideas and share your recipes. I can not wait to go through all of them and start printing them off to try. Thanks for saving me from serving another boring dinner! Yay!!! You are definitely going to enjoy them. Thank you so much.